1) How mobile browsing has over taken traditional desktop search with 60% of web traffic now from mobiles. This means that all business owners should be adopting a mobile first strategy with their websites. 2) The anatomy of a lead generation web page, what should be included and how to do this on your mobile site. 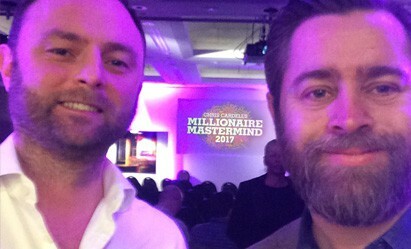 3) Wealth modelling, how we can copy traits and techniques from successful entrepreneurs and apply them to ourselves and our businesses. 4) The new Google Adwords gold rush, again mobiles and mobile search is a game changer here. 5) Finally pricing strategy, most businesses have the ability to transform their profits by experimenting with pricing strategies e.g. price increase / price elasticity, tiered pricing, premium pricing etc. A very enlightening two days which has confirmed much of what we knew already and given us some new ideas to implement.